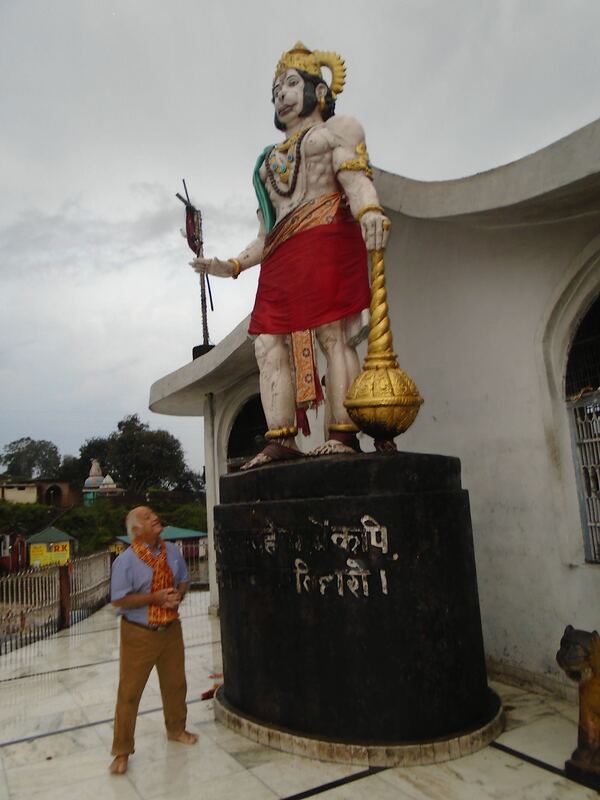 Swami Kamalananda takes us on a temple pilgrimage of a lifetime to visit the Shakti Peetha – some of Mother Kali’s most significant shrines, caves and temple in northern India. 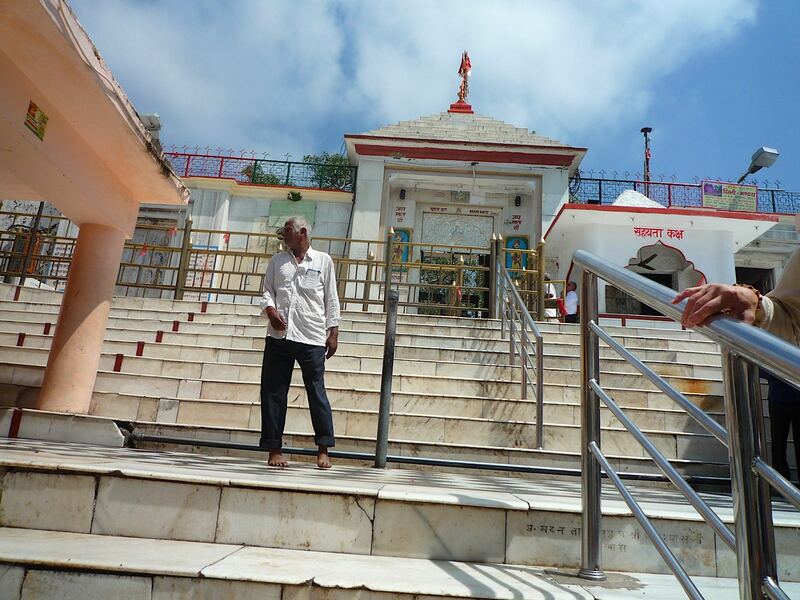 The Shakti Peetha are a group of important temples and shrines for devotees of the Divine Mother Goddess. 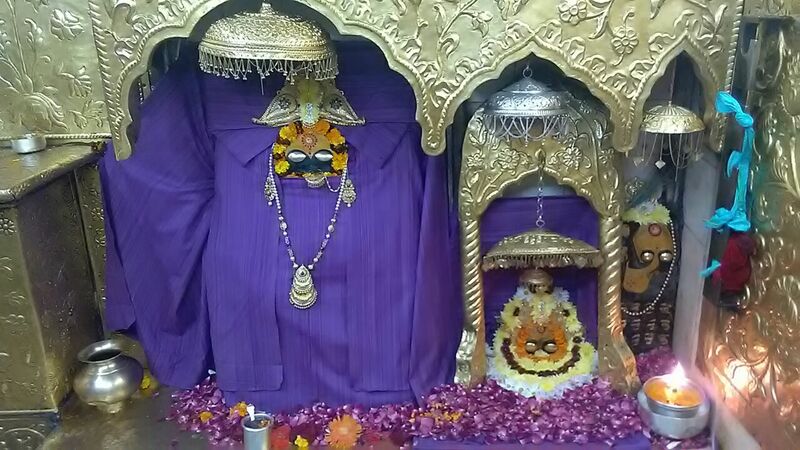 Each place in the Shakti Peetha is home to one of 51 body parts of the goddess Sati which fell on Earth to become holy shrines of great power. I still pinch myself at what has happened. 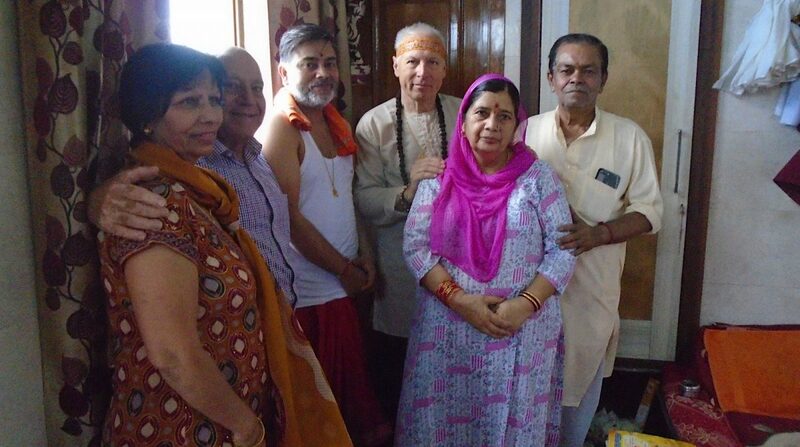 I had no great desire to go to India because I am blessed to be involved in daily worship at Mother Kali’s Shakti Temple here in Skanda Vale. 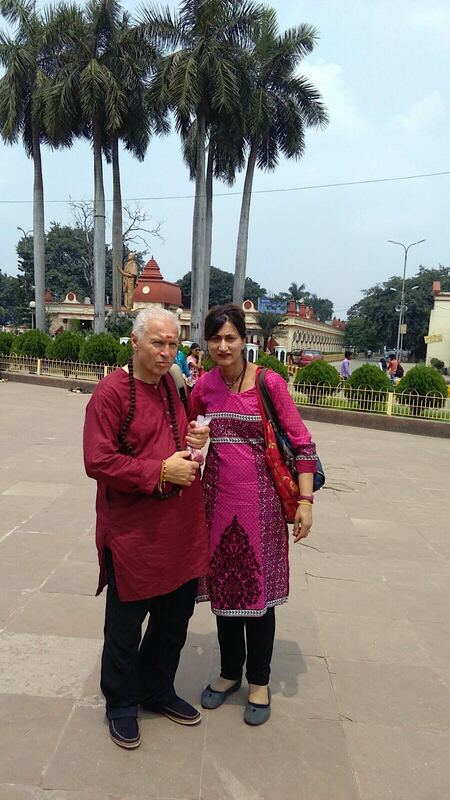 So it came out of the blue when I was approached by Anju, Aruna and Satish, asking if I would join them on their pilgrimage to Mother Kali’s shrines in India in early September. I thanked Mother and agreed to go. Very quickly and efficiently visas etc were organised and I was off. Stepping off the plane in India for the first time, already I sensed why I was there. The air was thick with devotion, so you could almost touch it… and this was just Delhi airport! 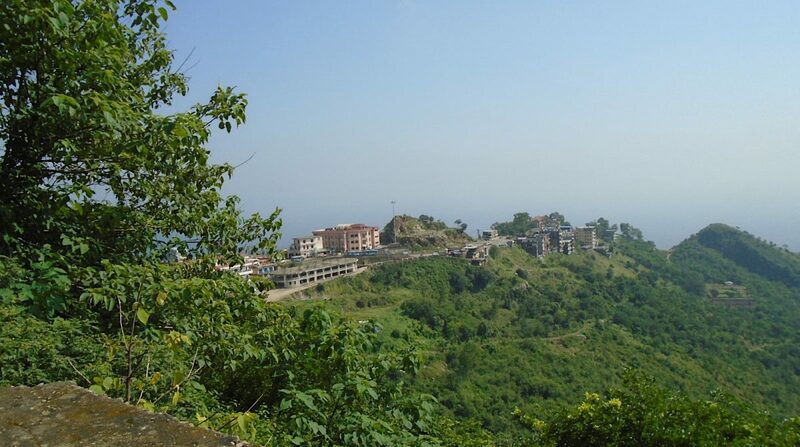 After a short rest we took another short flight up to Jammu in the Kashmir region. 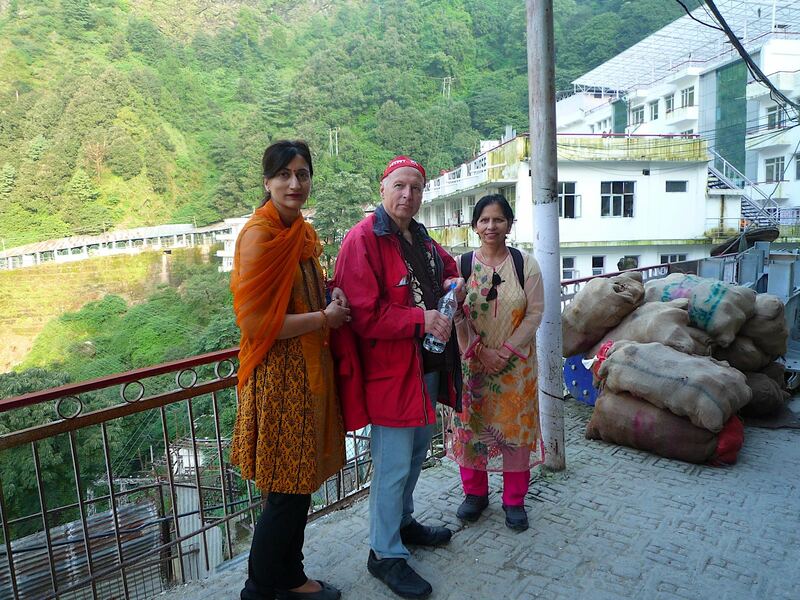 First stop – Shri Vaishno Devi Ma Temple. 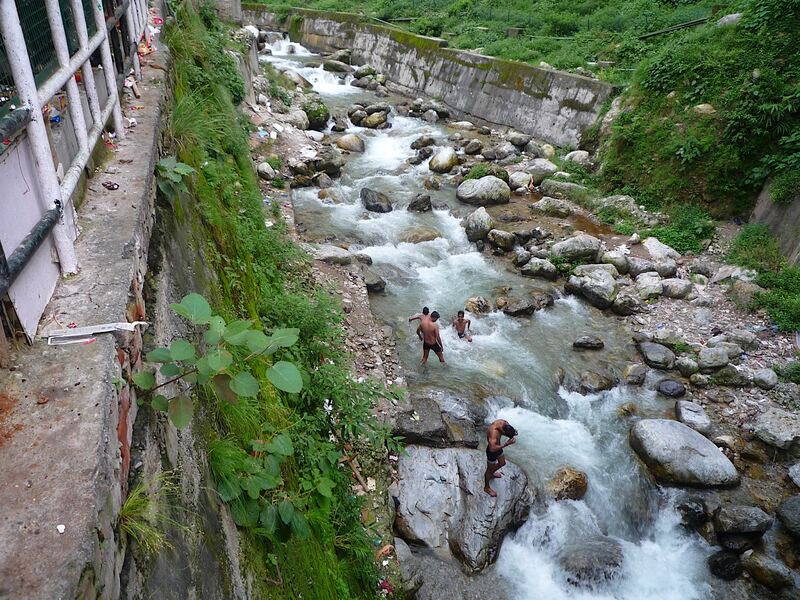 This was always going to be the highlight of the Devi Yatra, of the pilgrimage. 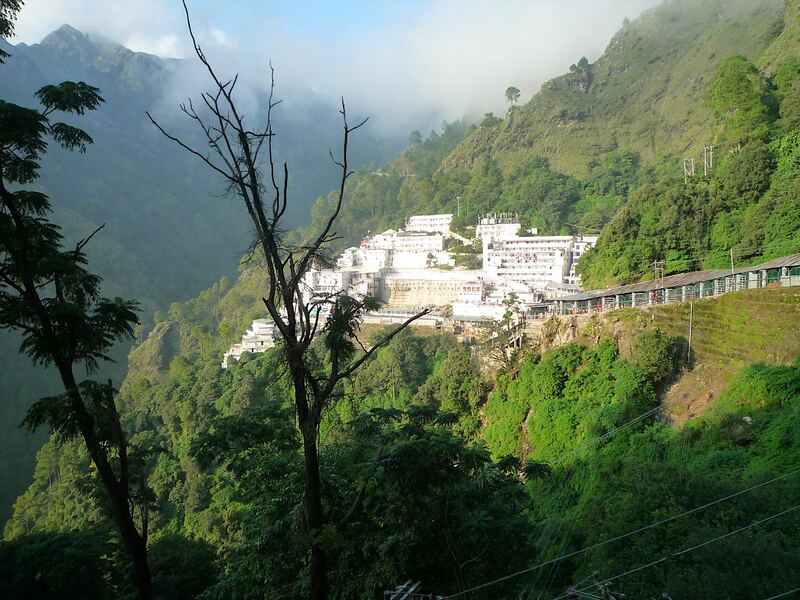 Having done some research before I left home, I discovered that Vaishno Devi Ma’s temple is the second most visited shrine in India, attracting one crore (10 million) pilgrims each year. 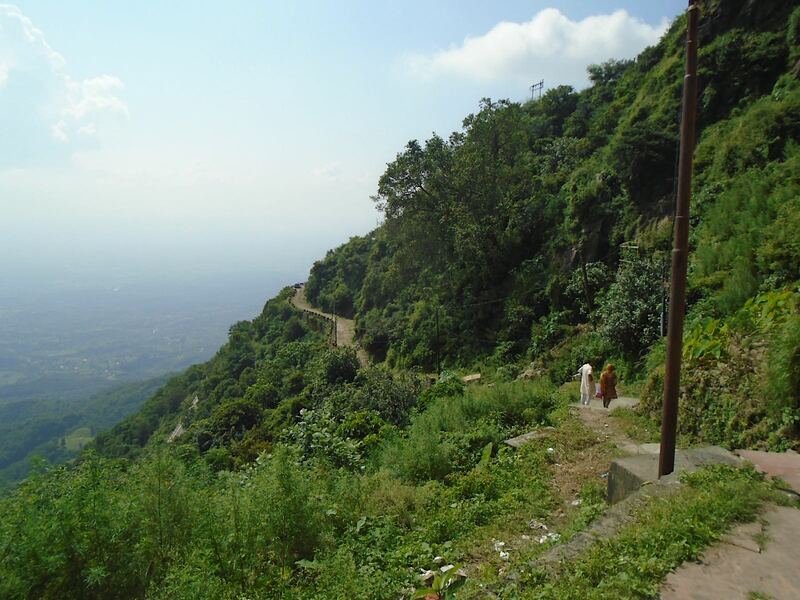 The pilgrimage to the temple involves climbing 14 kilometres up a mountain. A beautiful winding road takes you higher and higher, and the views are spectacular, like being in a plane looking down to the land below. But it is seriously challenging and if you’re not used to walking regularly it’s a major trial, plus the heat was about 36° celsius. However there are ponies and people carriers available when needed, helping to maintain the economy for the local youth. 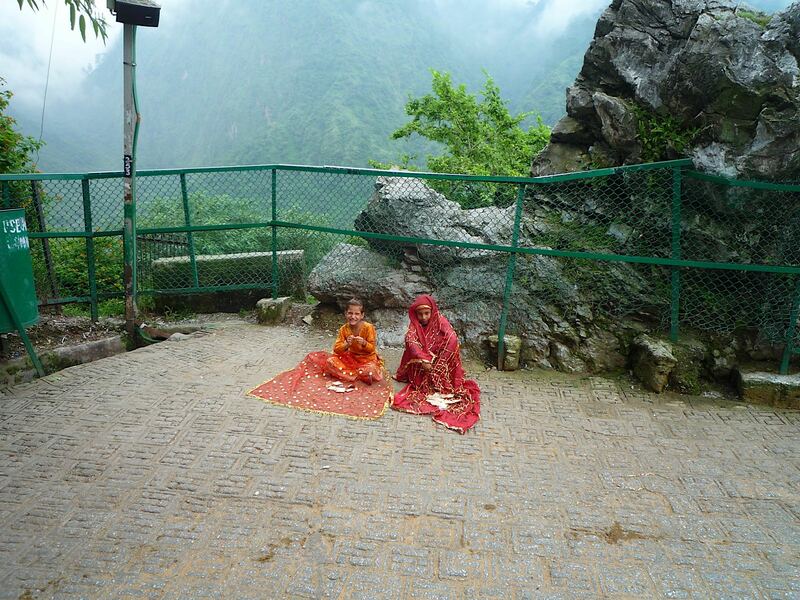 Talking of which, as you proceed up the mountain, young girls wearing red saris sit on the side of the road asking for donations from the passing devotees. People give them money because according to legend, one of them might be Adi Kumari, the Divine Mother appearing as a young girl. 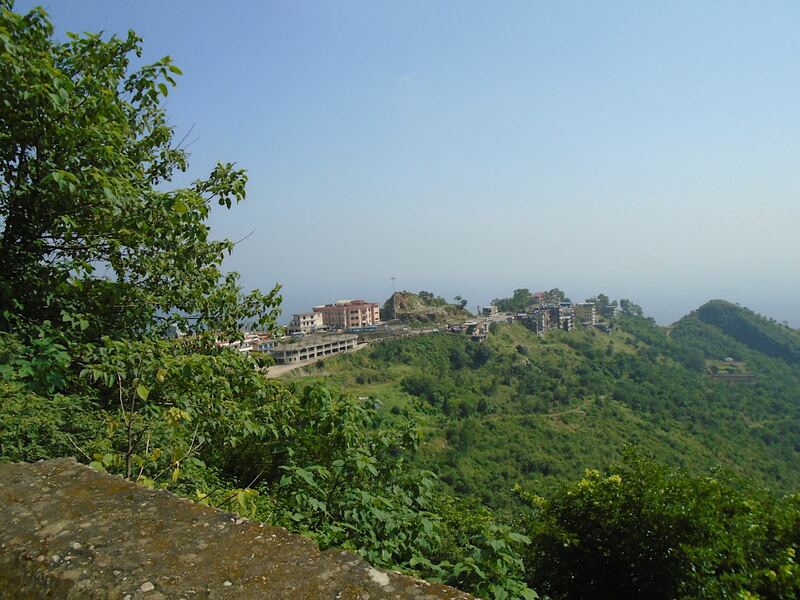 I felt determined to walk to the top, so when offered a pony I declined, but after about five or six kilometres it was noted that I had changed colour (a pale shade of grey in fact) so I was told to get on the pony and ride to the top of the mountain. Arriving at the summit, I had hoped to be able to go into Garbh Joon cave. 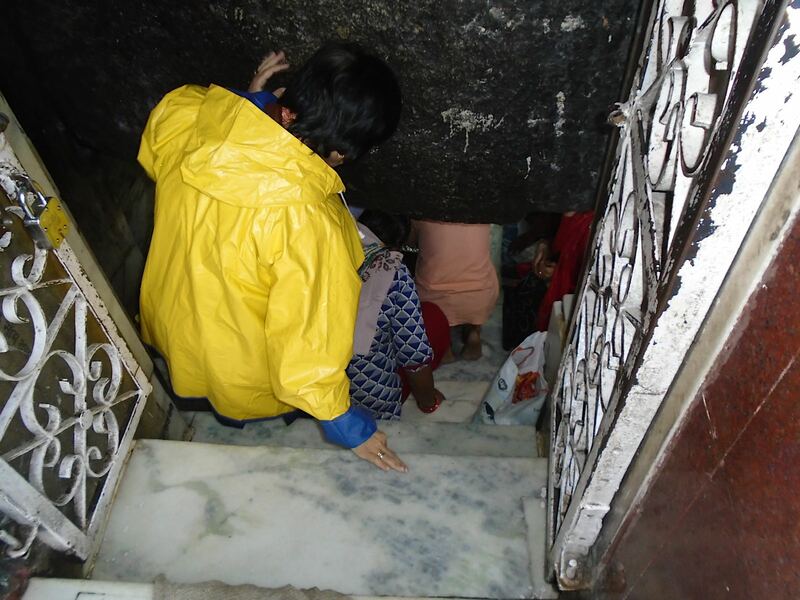 Climbing through the narrow, dark passages of this cave represents being in the womb – a process of spiritual rebirth, preparing you for the darshan of Vaishno Mata. Unfortunately this was not possible because of the large crowds, and there is now a locked gate several metres in front, preventing pilgrims from entering. 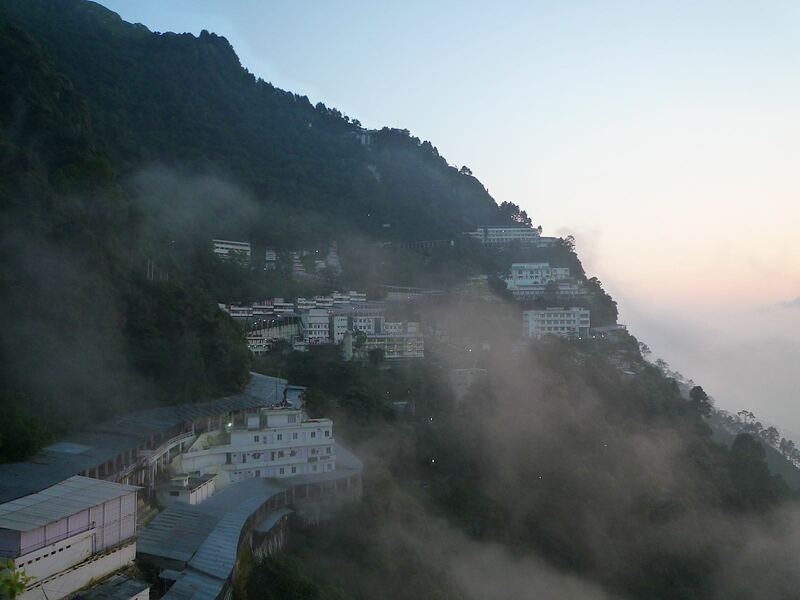 Nevertheless, I had a beautiful experience of Mother’s darshan in the main Vaishno Devi shrine. 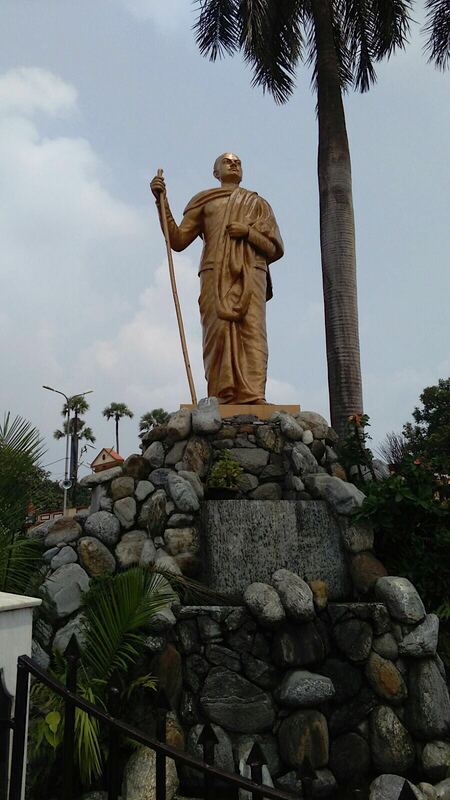 It reminded me of being with Guruji in the early days of Skanda Vale. Often I would go to speak to him, perhaps with questions, or a mind full of thought, but upon seeing him, a deep sense of silence would engulf me. All questions, thoughts and memories would cease to exist in the bliss that he emanated. 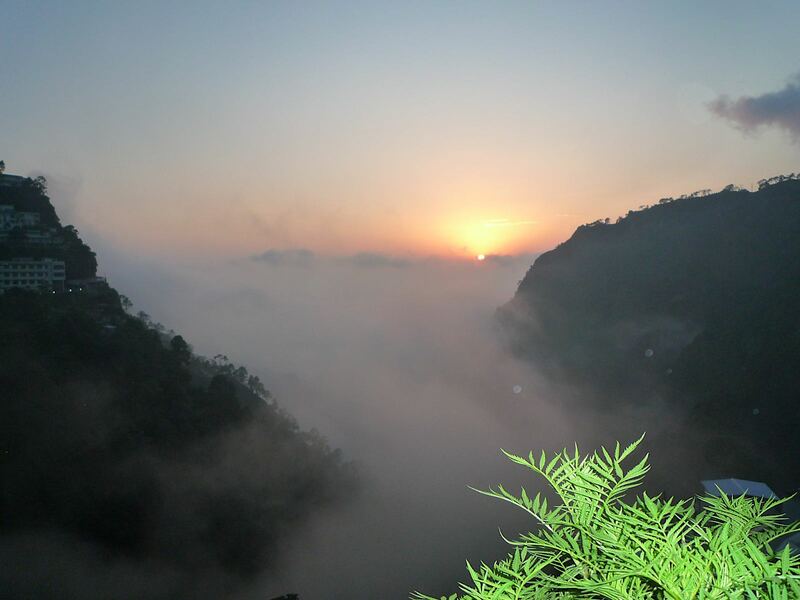 It was a similar experience that took hold of me there as I glimpsed the three Pindies of Lakshmi, Kali and Saraswati which have miraculously manifested within the cave of Vaishno Devi Ma. Her grace and power consumed me completely. 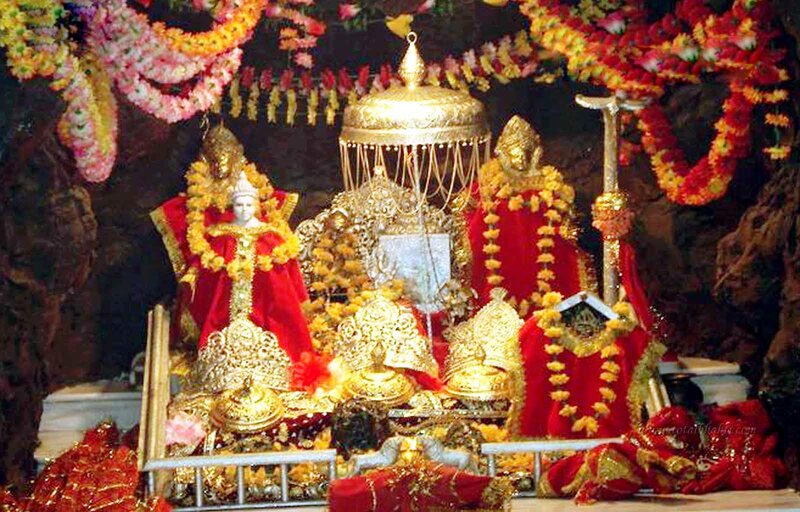 For further reading, I can highly recommend the book ‘From the Lips of Goddess Mata Vaishno Devi’ by Rajesh Talwar. Adi Kumari girls in red sari seeking donations. 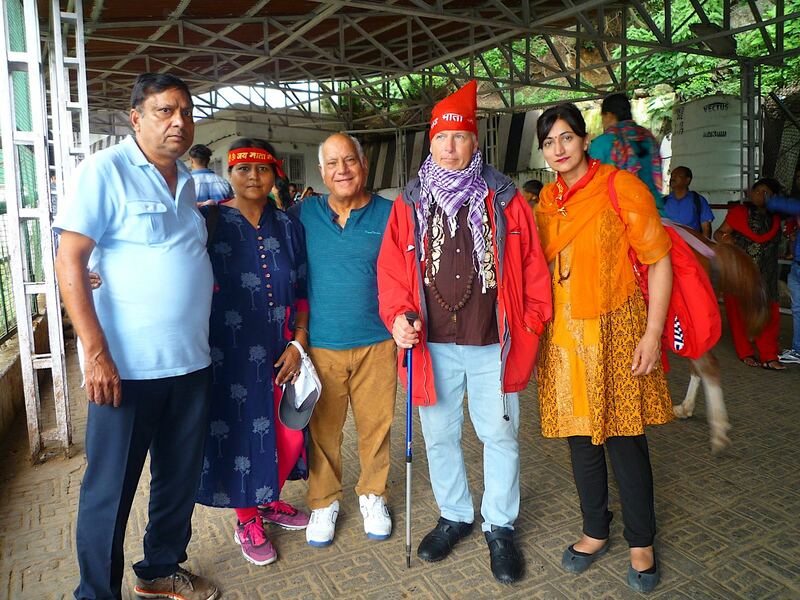 We were all quite tired and a little light-headed after darshan, but I was told that it’s essential for first-time pilgrims to visit Bhairo Baba temple to complete the yatra, so we walked on. 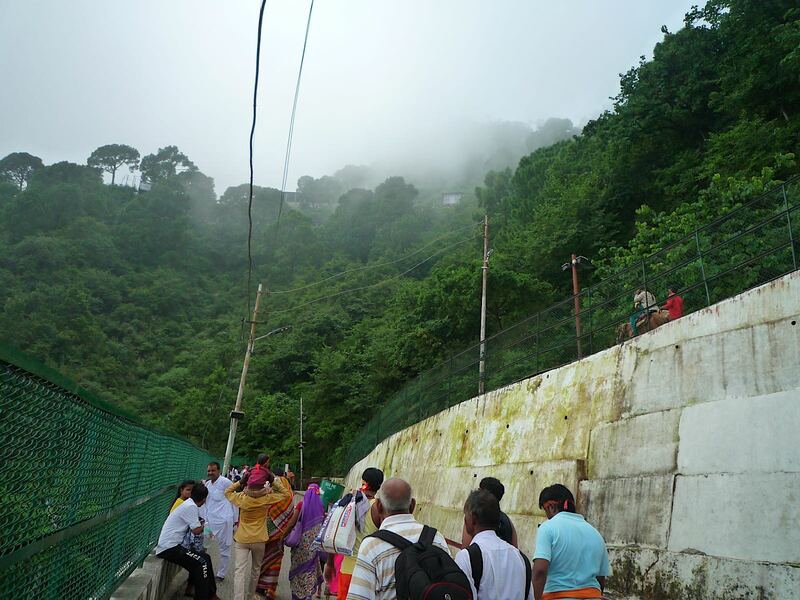 When we arrived, there were tens of thousands of devotees sitting around, relaxing before making their descent back down the mountain. I was impressed with how orderly and harmonious the crowd were. 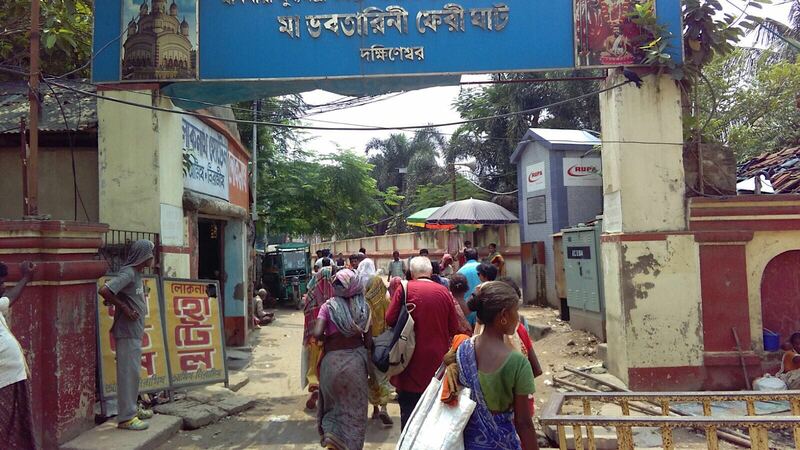 Nobody was pushing for darshan and there was no favouritism or VIP treatment for wealthier pilgrims. There seems to be a philosophy here that, in the eyes of Mother, all Her children are equally deserving of Her love – so there’s one entrance for everyone, regardless of worldly rank and status. It struck me here that our devotion to Mother Kali in Skanda Vale is in some ways very much in it’s infancy. 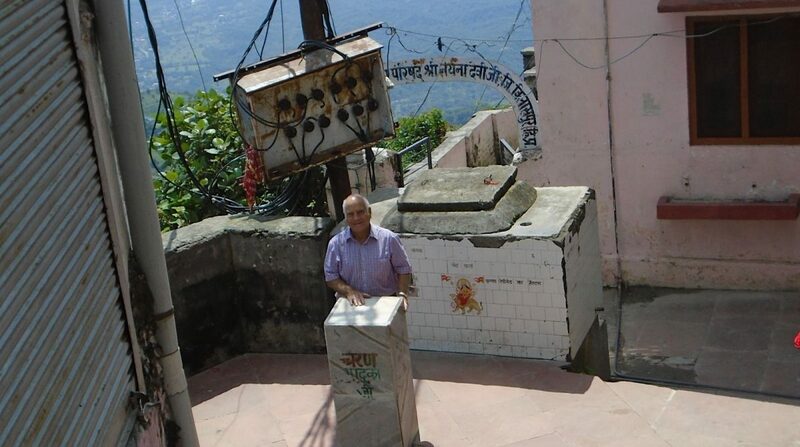 Mother has been with us here in the UK for some 40 years, but worship has been offered at these shrines in the Shakti Peetha for thousands of years. Another thing that struck me was how daily worship and pilgrimage is completely interwoven into the fabric of daily life in India. 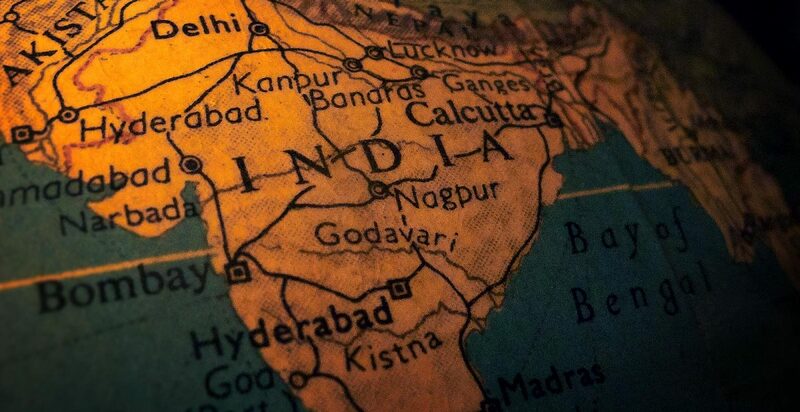 In the West we spend much of our spare time in entertainment and distraction, but I saw that, despite all the rapid cultural and economic changes taking place in India, pilgrimage, prayer and worship remain at the heart of Indian life. 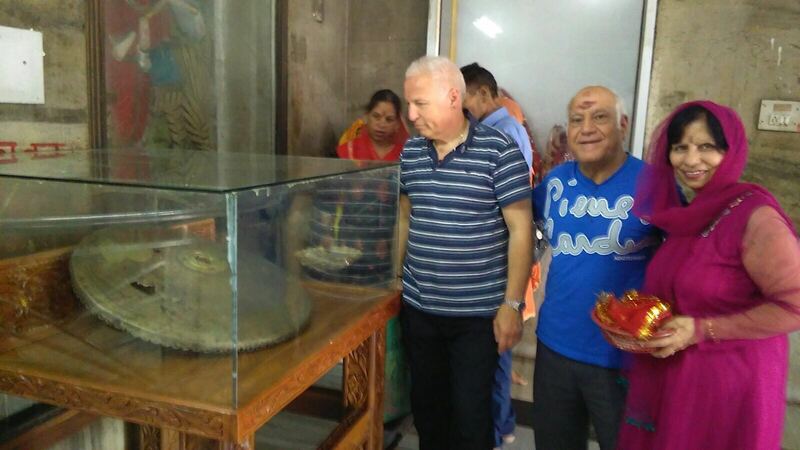 We took a brief detour from our Shakti Peetha pilgrimage to visit one of the largest temple complexes in North India, the Raghunath Temple, home to a vast number of fossilised Shaligrams from the Gandaki river in Nepal. 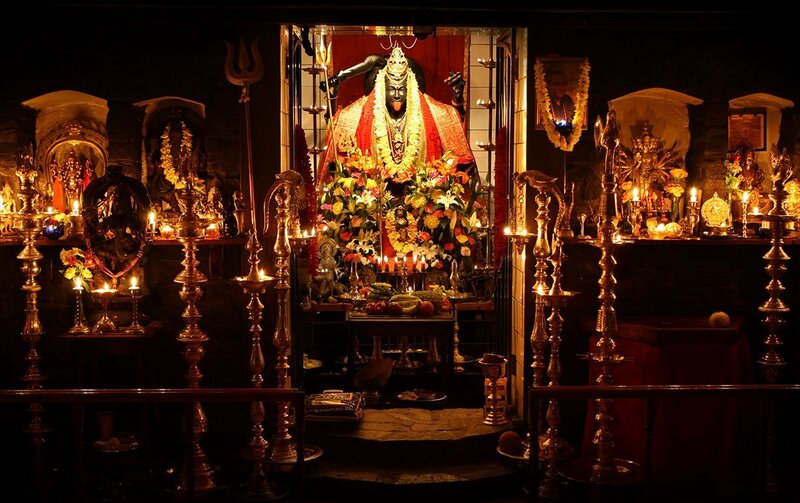 The atmosphere was just magical – chanting to Sri Ranganatha, I was quite overcome by a divine feeling. Later on, in a murthi workshop in Jammu I found a beautiful Shaligram, with clear ammonite markings and felt inspired to bring it home to Skanda Vale for worship in the Sri Ranganatha Temple. 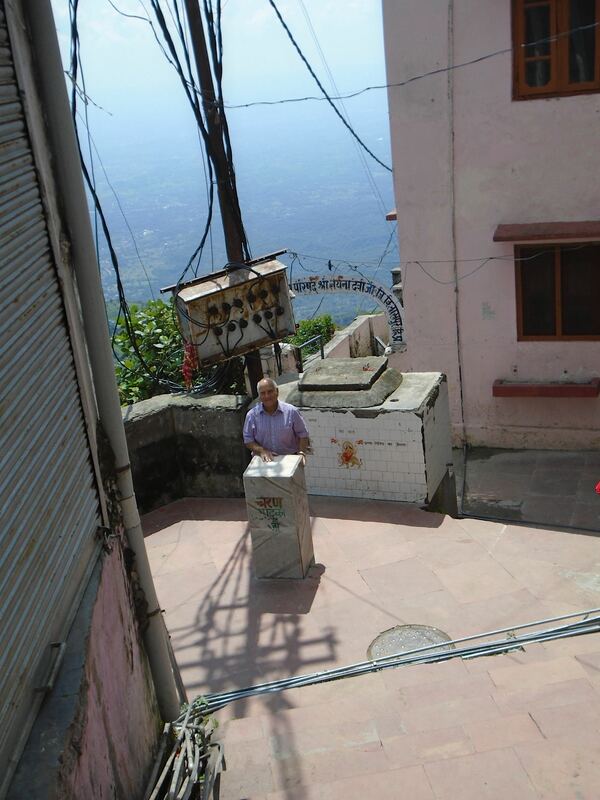 Here at the Naina Devi Temple I was interested to learn that a team of twelve priests take it in turns to lead worship for a period of one month each year. During this month each priest leaves behind his wife and family, and remains cloistered in the temple rooms at all times. The priest told me that in April each year a fierce storm begins. 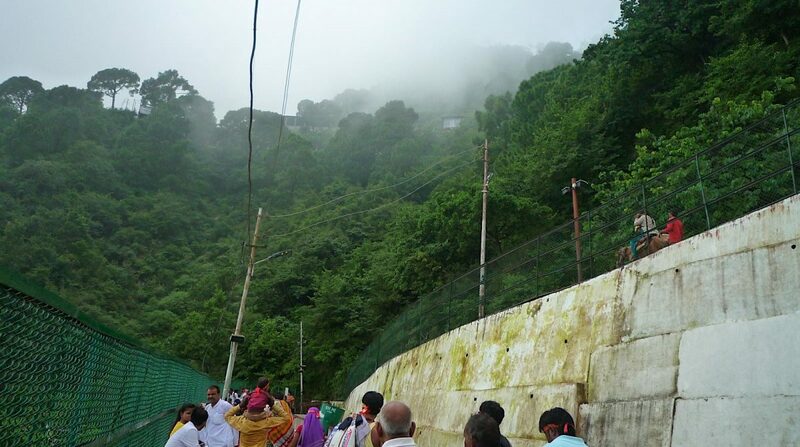 Devotees gather at this auspicious sign, to witness a floating flame emanating from the Jwalaji temple. 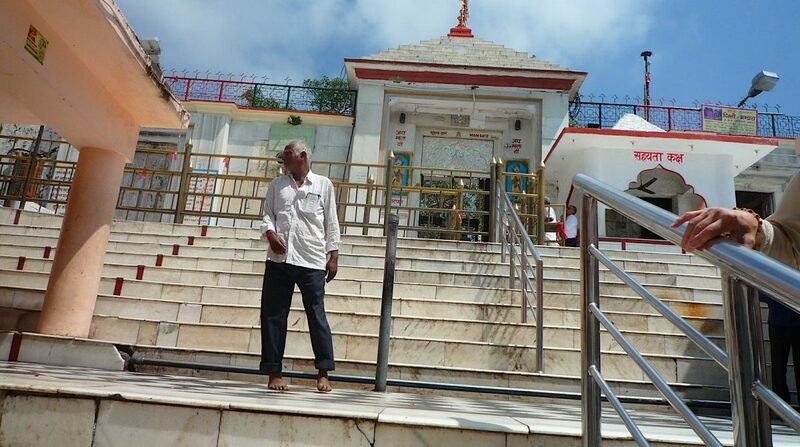 He then showed me a video clip, where I saw quite clearly the light travelling up the hill to the Naina Devi Temple, accompanied by devotional chanting and joyous shouts of ‘Jai Ma!’ from devotees. 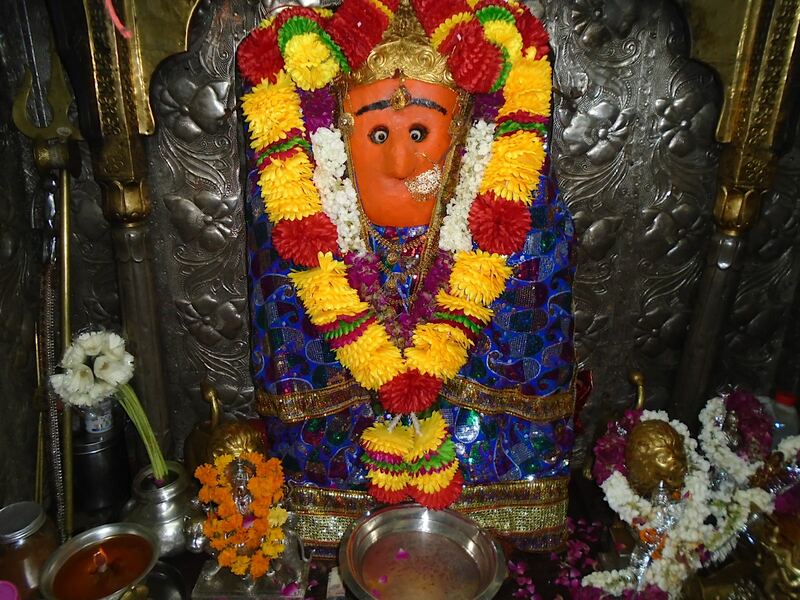 He told me that every 85 years Jwalaji Mata comes to visit Her sister Naina Mata and not one, but hundreds of tiny flames appear, landing in the trees and surrounding areas. A devotee told me that you can actually hold them in your hand, and they are strangely cool to the touch. People became quite emotional telling me this story, so it must be a very sacred thing to witness. The priest then explained that to lead worship in a Kali temple is very challenging as She is a particularly demanding deity, requiring great concentration and devotion, so that’s why they share this responsibility between twelve different priests. 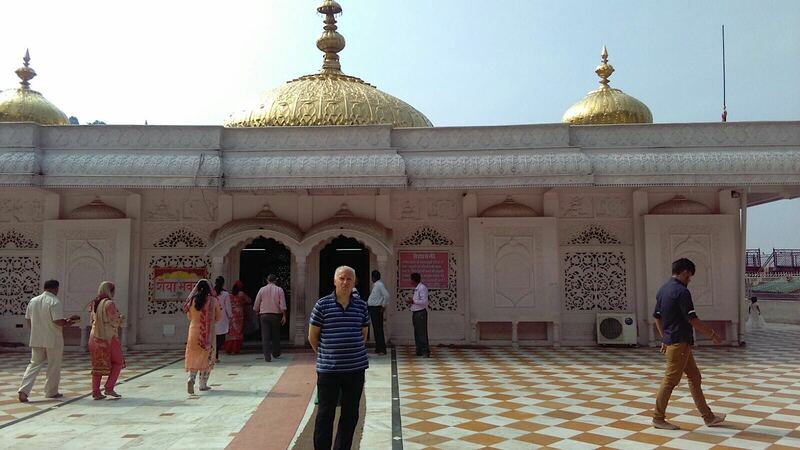 As we approached Mother for darshan, Anju and myself were beckoned in though a side door, and quite unexpectedly found ourselves inside the inner sanctum. In a state of gratitude and amazement I laid my head on the place where Mother’s eyes are kept, feeling quite overwhelmed by Her energy and grace. I was then fortunate to be invited to place my rudraksha mala on Devi’s eyes for blessing. We all felt there was something very special about this temple. 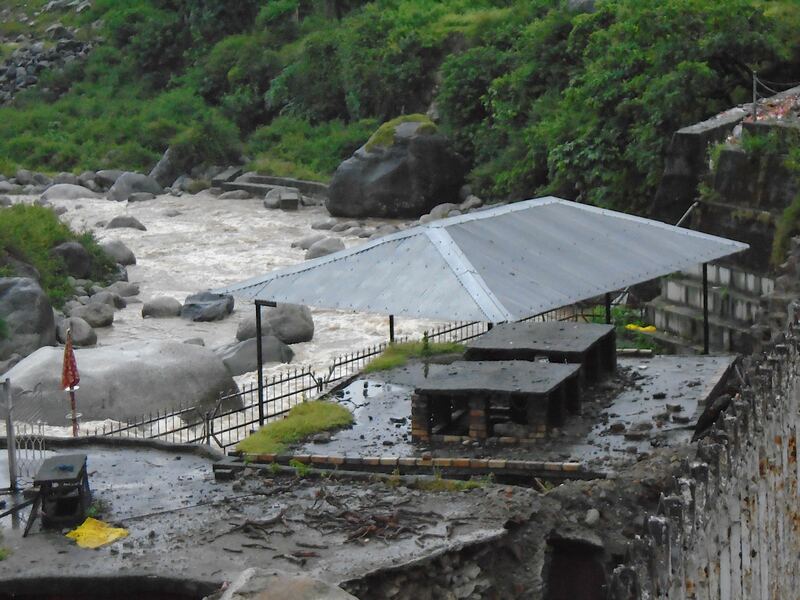 According to legend this the Jwalaji Temple is the place where Mother’s tongue fell and is known as the ‘burning mouth’ of Devi. Apparently the Mughal Emperor Akbar, a man of some considerable pomp and ego, once tried to win Jwalaji’s grace by commissioning a lavish golden parasol for Her. Seeing his impure motive, Mother rejected his offering – when the item was offered in the shrine it miraculously changed into a worthless metal. 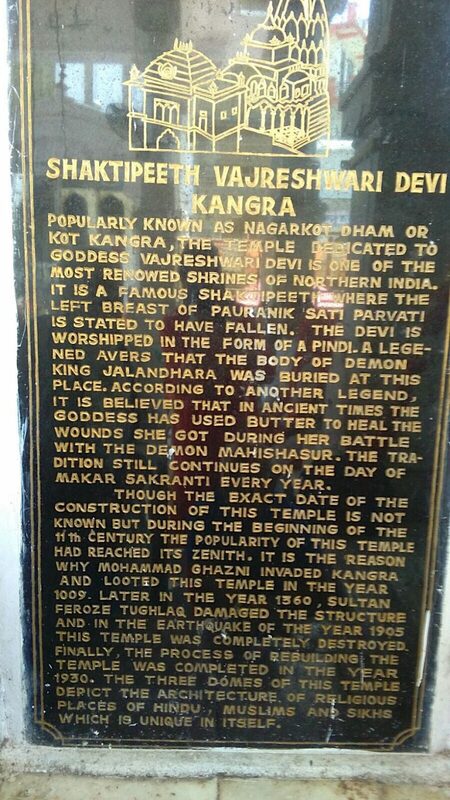 It began decomposing straight away, and is now on display outside the temple, full of holes, as a reminder to pilgrims of the importance of worshipping Her with a pure and selfless heart. 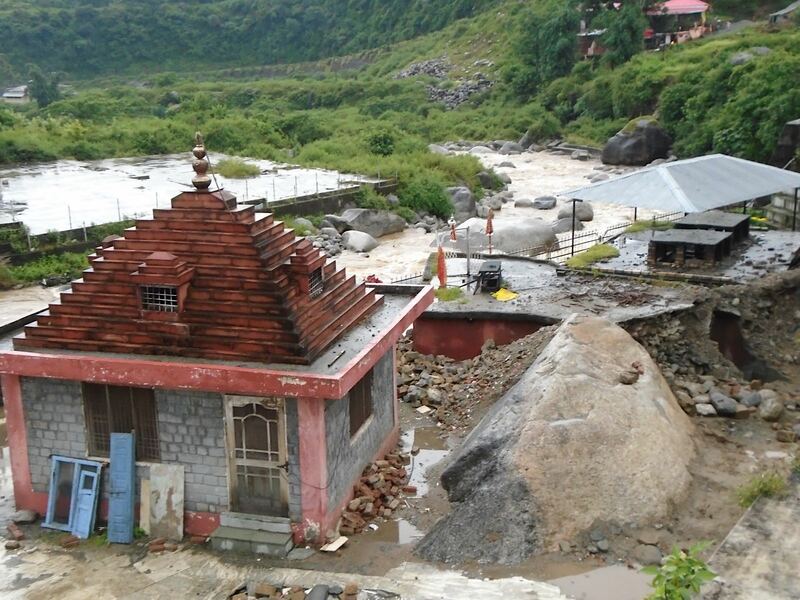 The Jwalaji temple is characterised by nine flames of natural gas that emanate from fissures in the rocks, burning endlessly. These mysterious flames are part of the wonder of Mother’s presence here, representing the burning, or destruction of pride, vanity, attachment and ego. The priest took us down some steps to the place where Mother’s tongue resides. Again we saw a sacred flame emanating from the rock (this was apparently the flame that travels up the mountain to the Naina Devi Temple each year). The priest took a cup of water, and in front of our eyes the flame jumped from the rock to the cup. The priest offered us this beautiful blue flame, burning on the surface of the water as aarti. We drank some of the sacred water as prasadam, and the priest sprinkled what remained over us as a blessing. 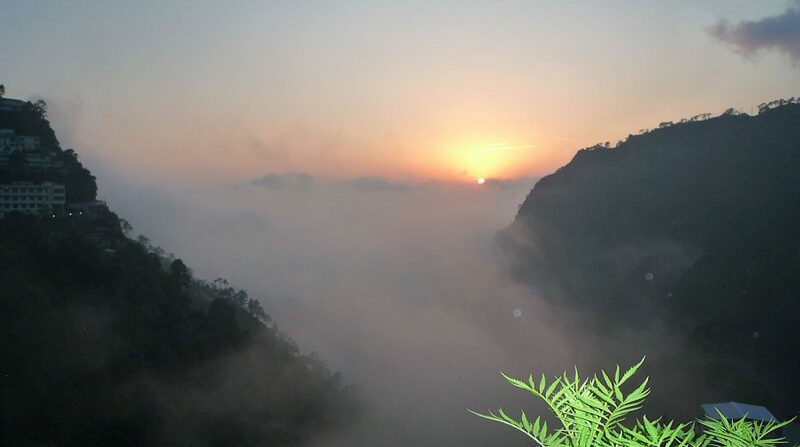 The whole experience reminded me of the elemental purity of Skanda Vale’s Sri Ranganatha Temple, where we worship the Lord and Devi in the wind, rain, snow and sun. 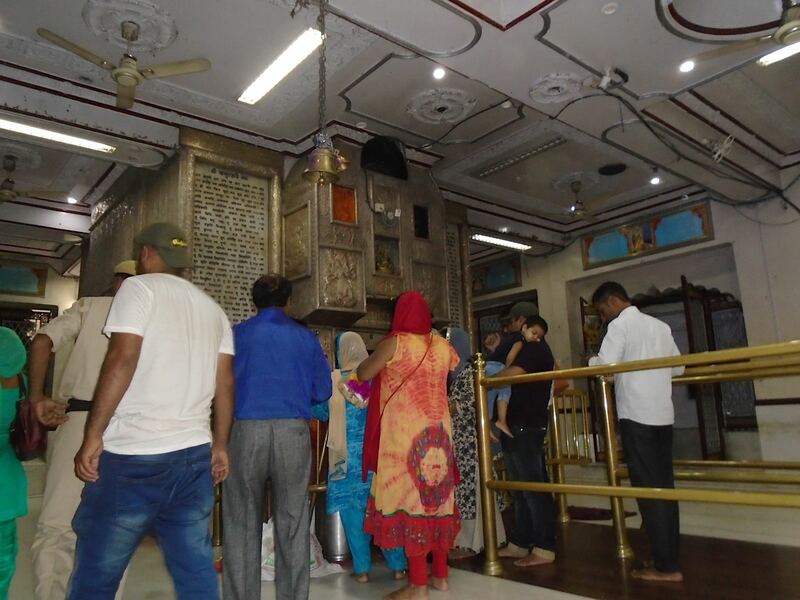 We arrived at the Chamunda Devi Temple in the evening to find a large group of young people singing bhajans, playing drums and clapping in harmony. We felt moved and inspired by the positive energy surrounding these young devotees. 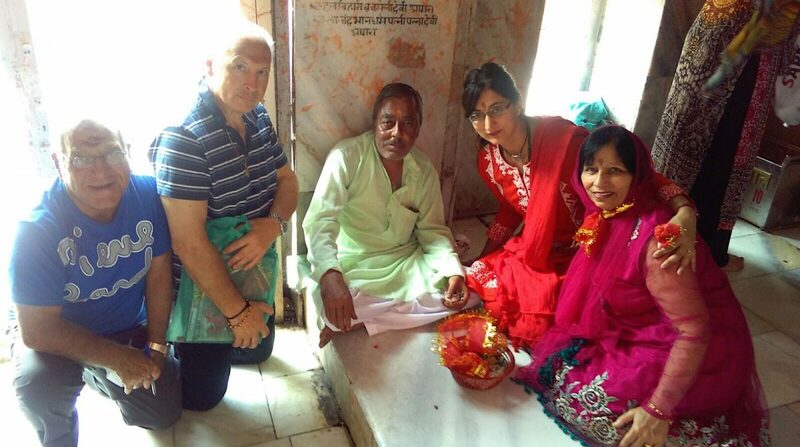 We spoke to the priest and arranged for a special puja to be done to bless the Shaligram that I had bought previously. 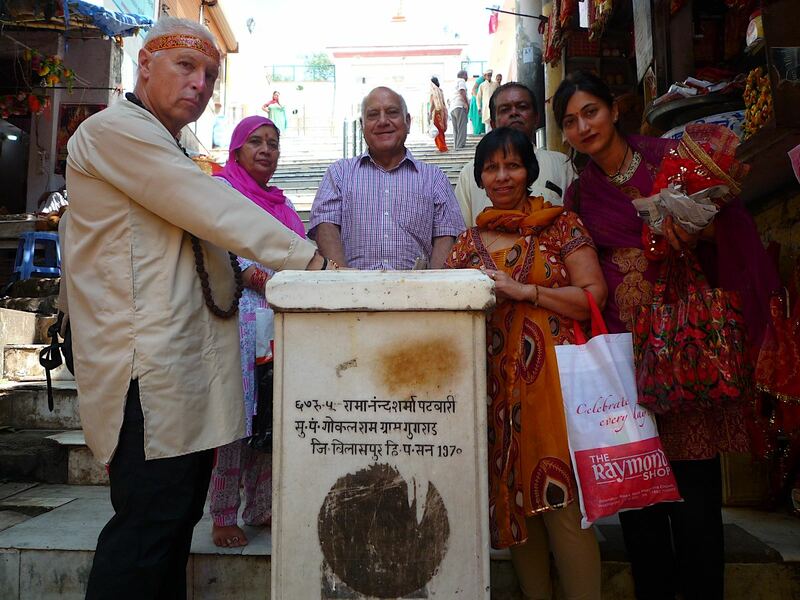 The priest placed the shaligram at the feet of Chamunda Devi, and we returned to our hotel. At 3.30am there began an epic thunderstorm, waking us from our sleep. The power of this storm was like nothing I had ever experienced – the building shook with every thunderclap, and the lightning illuminated the night sky like broad daylight. By 5am the rain was coming down in torrents, fortunately our taxi driver dropped us very close to the entrance of the temple, so we didn’t get completely soaked. Inside the temple, all was quiet and peaceful. A handful of devotees came for Mother’s darshan before work. The priest motioned for us to sit down and asked us to sing bhajans whilst he conducted the puja. 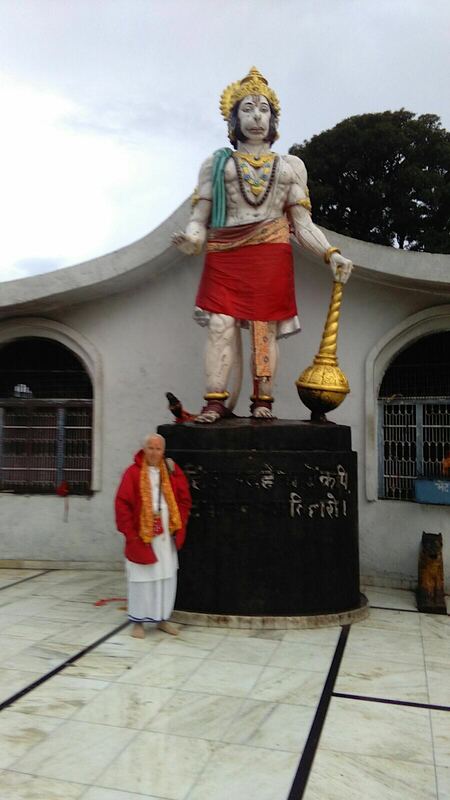 I started with the verse we sing every day in Skanda Vale during Mother’s final aarti – ‘Chamundaya, Kali Ma, Kali Ma, Kali Ma’ – and here I was in front of the actual Chamunda Devi murthi! The priest smiled in approval. Anju noticed that during the puja a large queen bee (one of the manifest forms of Mother) landed on my shoulder and sat there, quite still for some ten minutes or so. 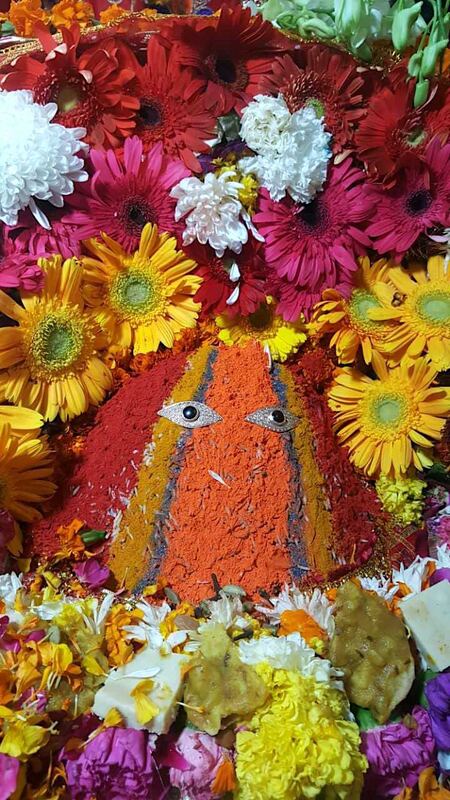 Later on we were shown into a subterranean cave where a priest was performing a puja to a Shiva Lingam – he explained to help balance the shakti of Mother Kali in the temple above. He then told us (like every other priest in every other temple) that Chamunda Devi’s was in fact the most important temple in the whole Devi Peetha! Each priest seemed to sincerely feel that his temple was at the centre of Mother’s attention – such is Her omnipotent grace. Alongside the temple were burning ghats, where bodies of the deceased are cremated. Much in the same way as they are offered to Shiva in Varanasi, here the dead are offered to Mother for Her to untie the knots of karma binding the soul to this earthly realm. The priest told us that the smoke from the funeral pyre actually enters the temple sanctuary, regardless of the wind direction, to be sanctified by Mother each day. 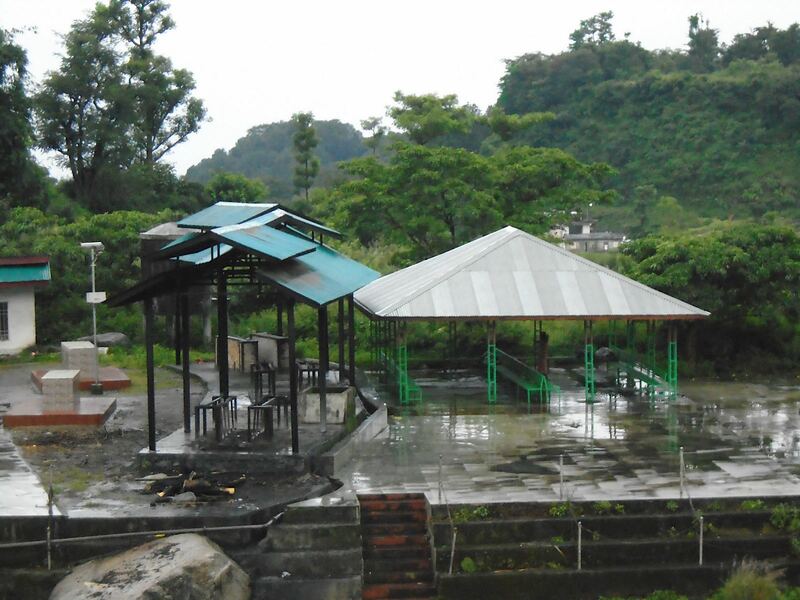 He emphasised that, miraculously, the smoke never enters the main temple, but only the inner sanctuary. The feet of Divine Mother reside at Chintpurni Temple, but to be quite honest our experience here was somewhat spoiled by the priests who were overly assertive in their request for donations, so we took darshan and left. I was reminded again of my Guru’s tremendous faith and courage in following Lord Subramanium’s edict that no devotee visiting Skanda Vale should ever be asked for donations. Not only that, but I was filled with appreciation for the free access that devotees have to the Divine Mother Kali at Skanda Vale. Here in India, there were long queues of people in each of the temples we visited, so generally speaking, devotees could only spend a few precious moments in front of Mother. 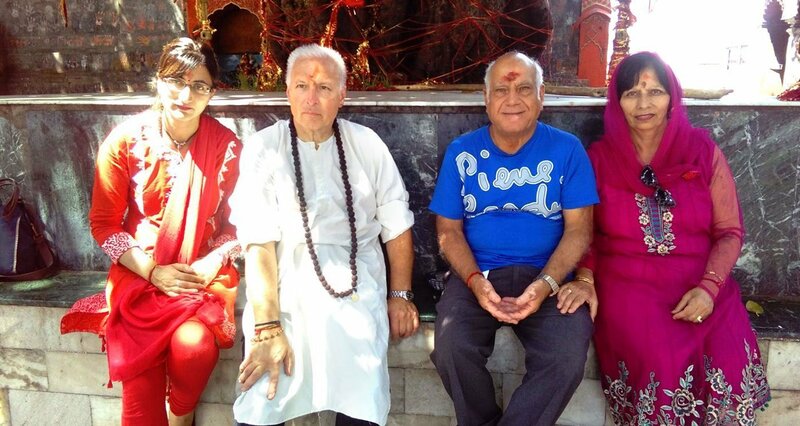 At Skanda Vale, it’s only in the very rarest of cases that we need to usher devotees onwards during darshan – our pilgrims are free to enjoy Mother’s gaze for as long as they need. Now I gained an even deeper appreciation of the opportunity that’s available here at Skanda Vale. 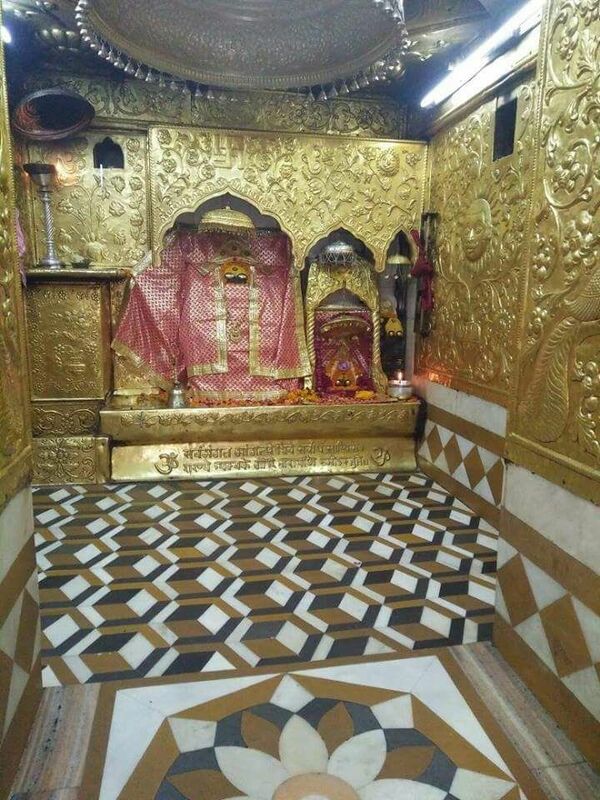 Bagalamukhi temple is renowned as a place to go to counteract any negative energies or black magic. 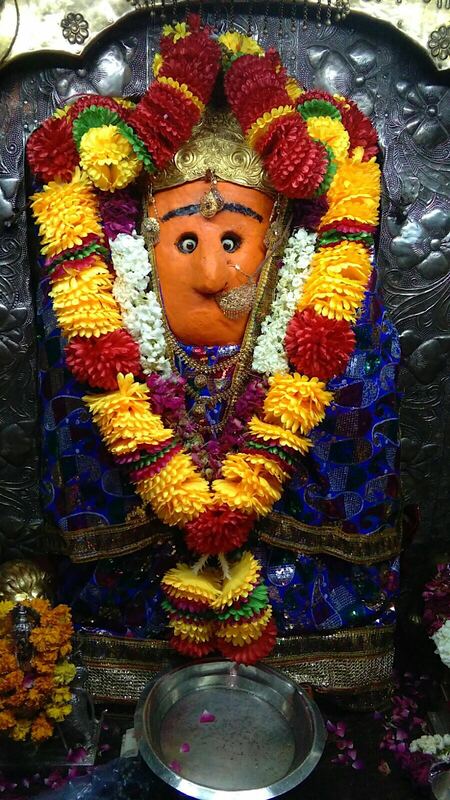 Here, just a glimpse of Mother is enough to clear away any negative impediment in the sādhaka’s path. 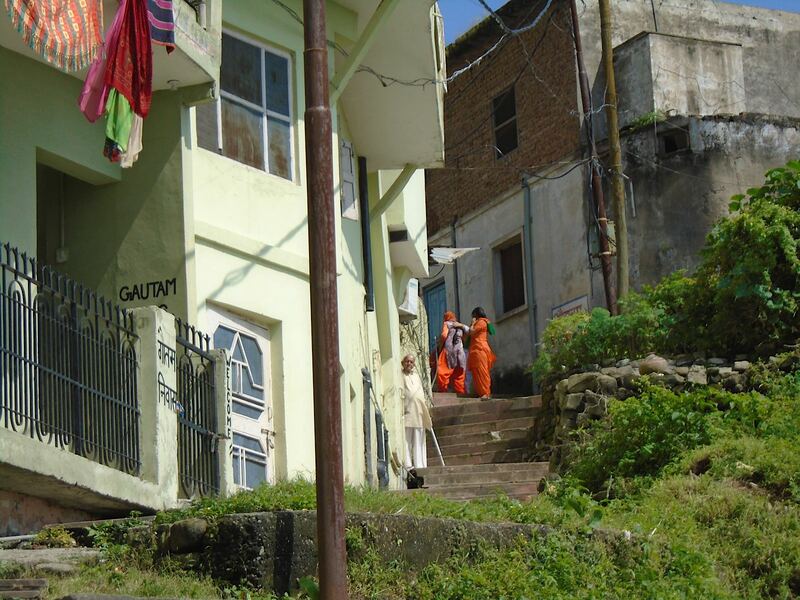 Curiously, everything here is a bright yellow – the temple, the robes, even the prasadam! I really wish we could have spent more time here as I enjoyed the quiet serenity of the shrine. 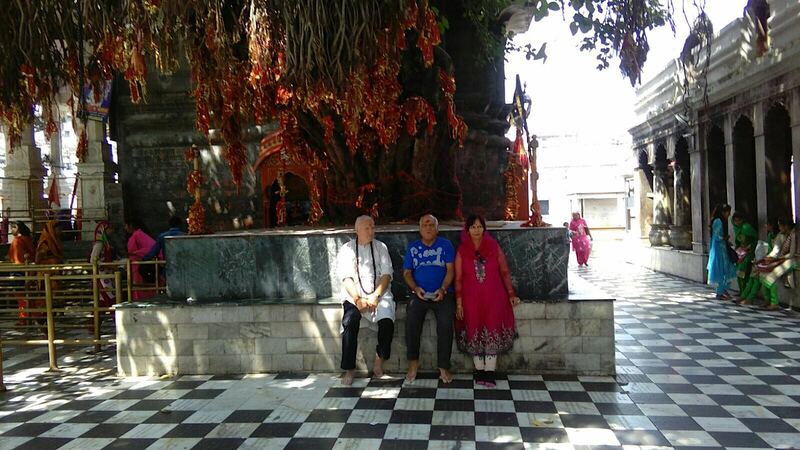 We had quite a full itinerary, on some days we visited as many as four different temples. Maybe one day I’ll have a chance to return for not just a taster, but a main course! 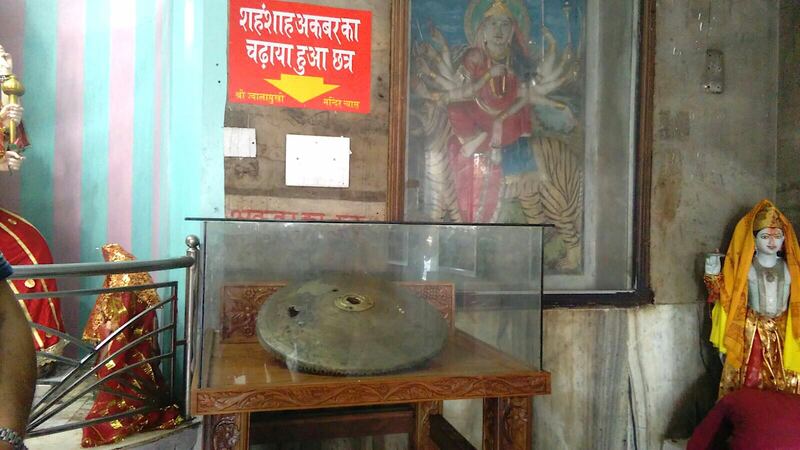 We then visited the ancient Vajreshwari Temple, home of Mother’s left breast. 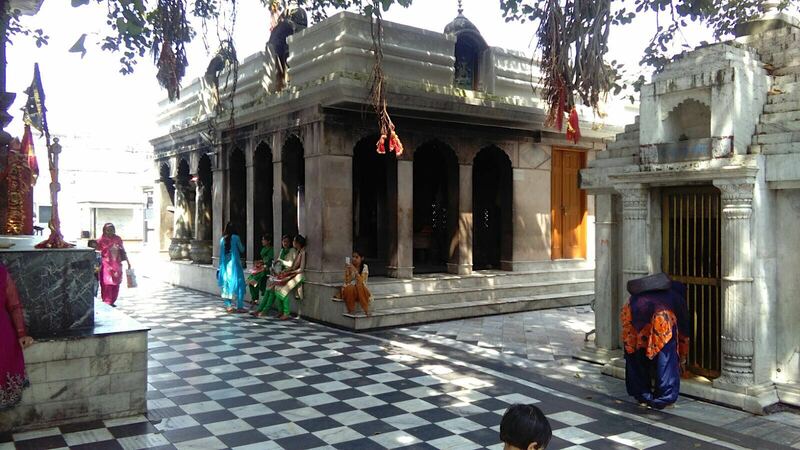 According to some pilgrims I met, this temple is particularly popular with female devotees who pray for healing of breast cancer and other illnesses. You can really feel that there is a nurturing, motherly quality to this temple, as no-one is allowed to leave without first being fed! 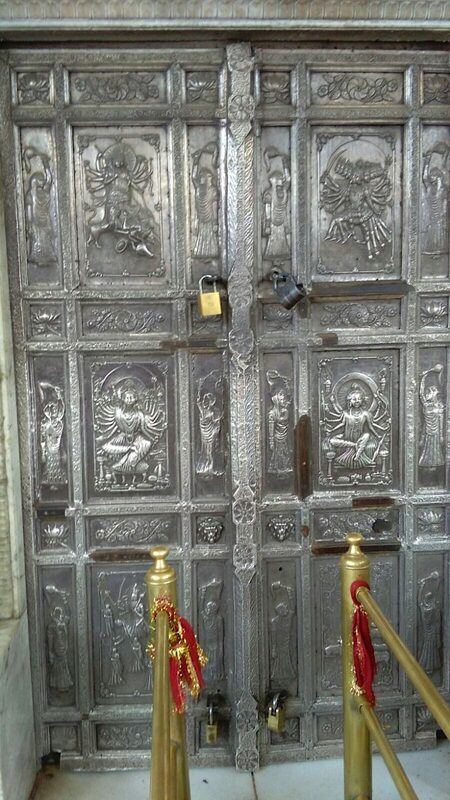 We had prasadam here in the langar (food) hall, and admired the beautiful depictions of Mother Kali on the ornate silver doors. 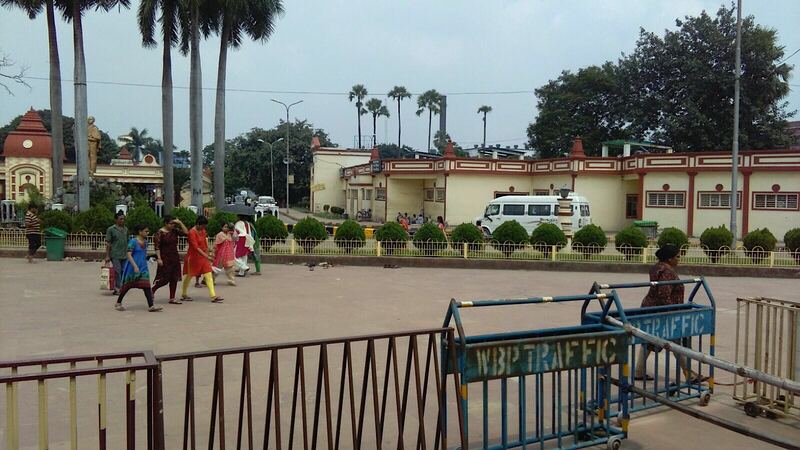 When I first heard that I would be embarking on an auspicious Devi Yatra across India, my heart leapt immediately to Kolkata, and specifically to Dakshineswar, where Sri Ramakrishna Paramahamsa lived and worshipped. Arun and Satish graciously organised this part of the pilgrimage, and so after a two hour flight, we found ourselves in the centre of one of the most significant sites in Shaktism. Part of Skanda Vale’s spiritual lineage descends from Sri Ramakrishna and Swami Brahmananda, so it felt especially significant to be here, at long last. 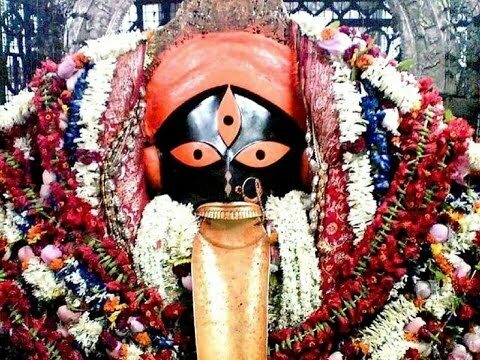 Within the temple at Dakshineswar I enjoyed darshan of Kali, albeit at a distance, I handed the priest a picture of Skanda Vale Kali as a gift. He then passed me a packet of deep crimson kumkum powder as prasad. This simple act resonated with significance as on the previous night I had been talking with Anju about the privilege of wearing Mother’s tilak during mahabhisekams. This prasad from Dakshineswar Kali sits on my shrine and I always wear it when worshipping Her. We then went to Sri Ramakrishna’s living quarters, where his bedroom has been made available for devotees to pay their respects to him. I gave the priest a picture of Skanda Vale Kali and he placed it on the saint’s bed with great reverence. 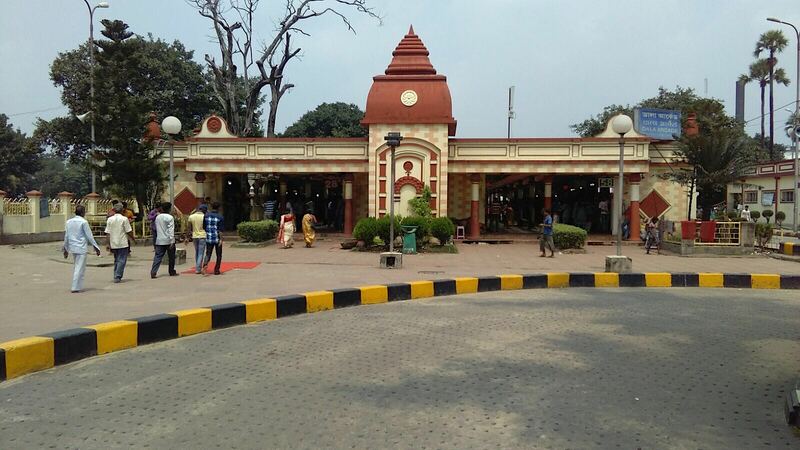 The famous Kalighat Kali Temple is home to Devi’s toe and is known as ‘the steps to Kali’. Outside the temple are hundreds of flower sellers, selling one type of flower only – the red hibiscus – Mother Kali’s favourite. 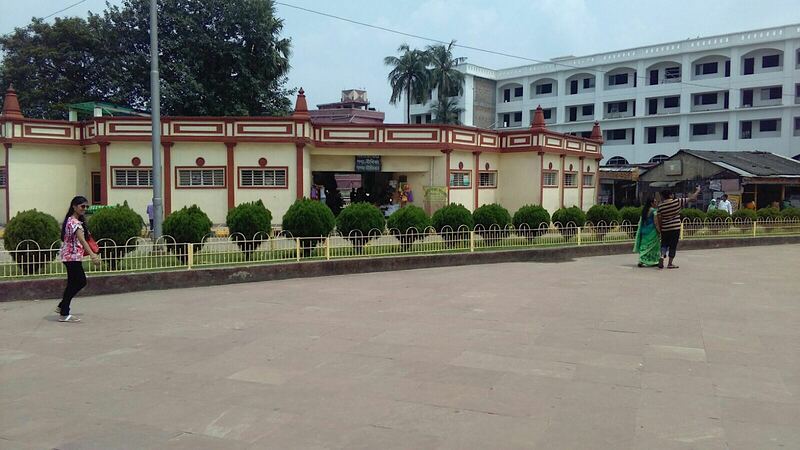 Inside, we were met by a crush of devotees eager to have darshan before the temple closed for lunch. I held back from the throng, and was approached by a man, whom I presumed to be a temple official, who wanted to show me around. He took me to a place and told me ‘this is where we perform our daily sacrifice of a goat’. He then asked for a donation, to which I replied with some embarrassment ‘I’m sorry, I have no money, I’m a monk’. He shrugged and walked off, leaving me somewhat disoriented, not knowing where the rest of the group had got to. 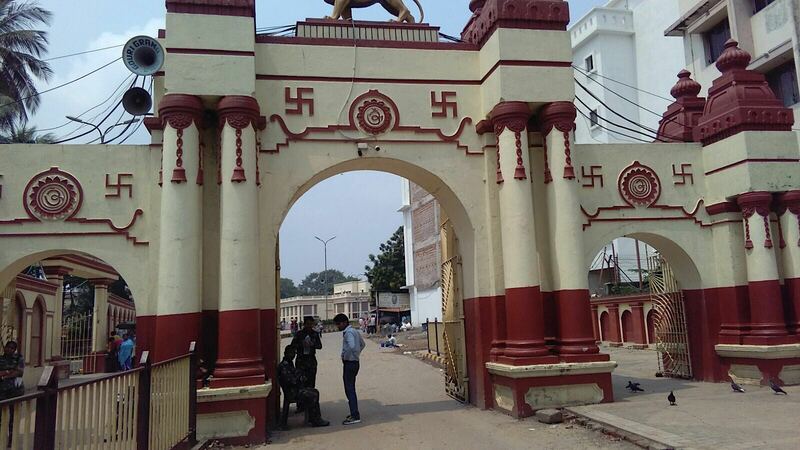 I wondered whether maybe he didn’t represent the temple after all. Nevertheless, I made my way back to the main shrine where I found Aruna and Satish beckoning with great enthusiasm for me to come to the front. 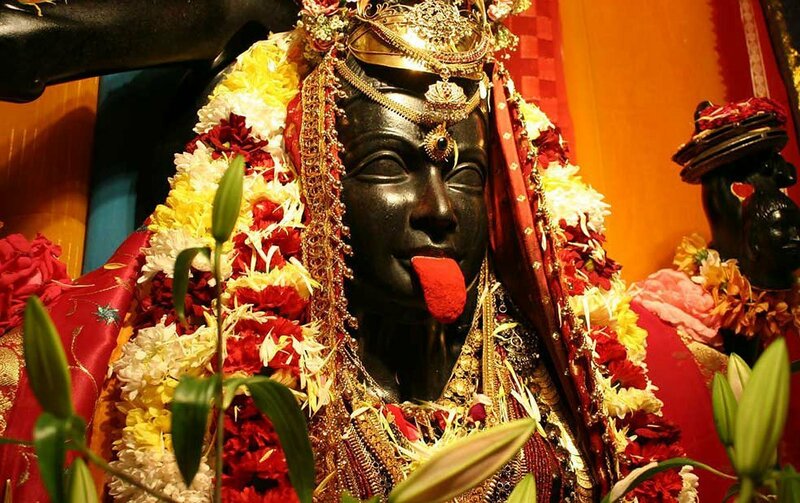 This murthi of Kali has a 12 inch long golden tongue, and as I entered the sanctuary I was quite amazed to hear the temple priest tell me, in a commanding tone, that I must hold it. He had no idea that I was a monk, as no-one had told him of my arrival. It seemed he was inspired by Mother to grant me this boon, so I didn’t question him, but held Mother’s tongue with both hands and was filled with Her shakti. 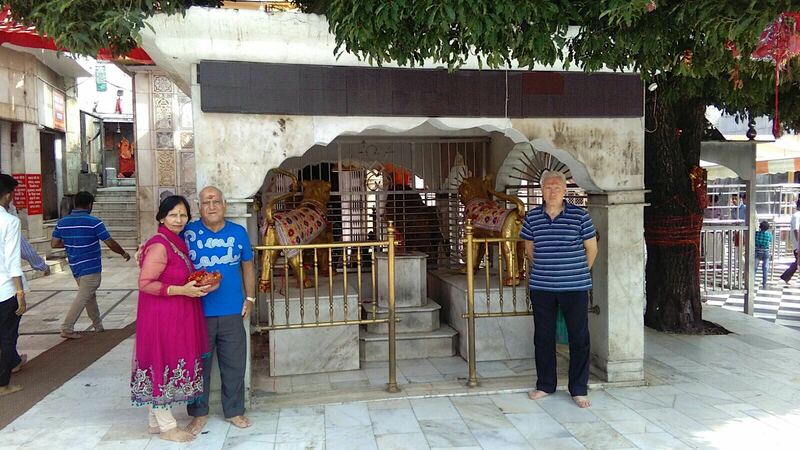 I then offered Her aarti there in the shrine. This was one of the highlights of the whole yatra. At this point I felt sincerely that my life’s wishes had been fulfilled, and I was happy. There was such a profound sense of completion. This is how I feel the Divine Mother blessed me on this beautiful holy pilgrimage. It is true and I experienced it. First and foremost my thanks are to Guru Sri Subramanium, without whom none of this would have been possible. Thanks for the incredible kindness and generosity of Aruna, Satish, Dr. Gupta and Anju and their families both here and in India. 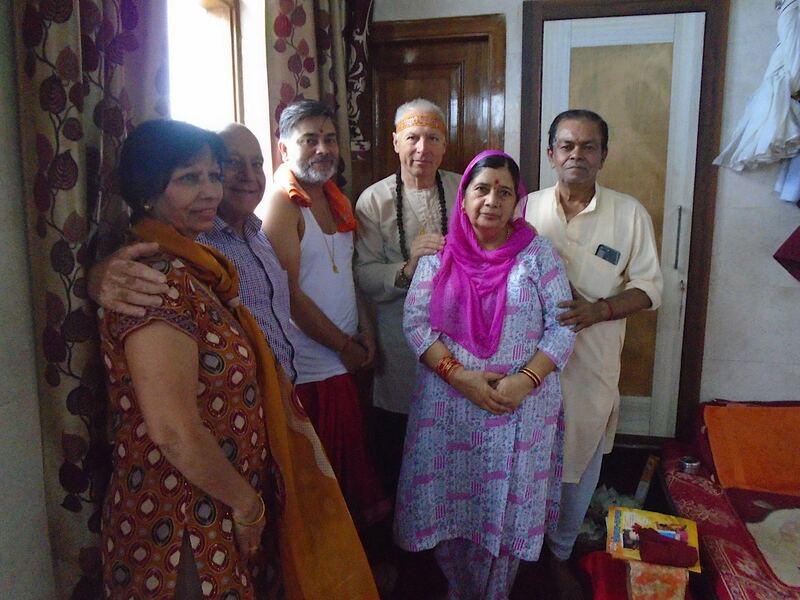 Thanks also to the Swamis, brothers and sisters of Skanda Vale who enabled me to fulfill this special pilgrimage. If there’s one thing to take away from this trip of a lifetime, it’s an appreciation of the beauty of pilgrimage; the sincerity and devotion of the pilgrims I met was very moving, and the sense of sacred duty and generosity with which the priests care for their pilgrims made a deep impression on me. I now feel moved to do as much as I possibly can for Skanda Vale pilgrims. I really want to push myself to help our devotees experience the same grace that I enjoyed, in whatever way I can. 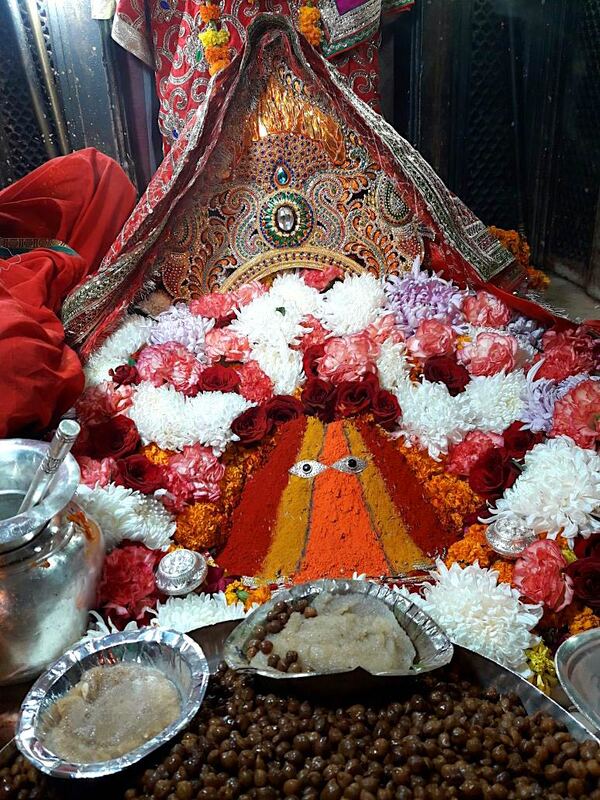 Jai Maa.